This one's a double-size (252-pages!) "special tribute" issue honoring Will Eisner, that "celebrates the life, legacy and Spirit" of one of comics' greatest masters. 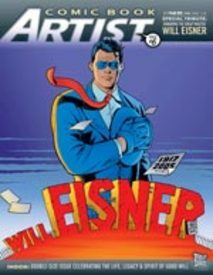 It's packed with interviews, essays, illustrations and comics all honoring the life, memory and impact that Eisner had on fans, creators, the industry and American culture. From Jules Feiffer, Jack Kirby and Stan Lee to Scott McCloud, Dave Sim and Art Spiegelman and dozens more in between, a who's who of comics pays tribute to one of the few comics creators whose influence can truly be said to permeate the entire field.